Thank you for considering The Ringling for your upcoming wedding. 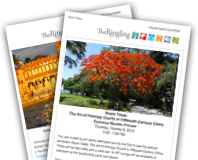 With breathtaking architecture, beautiful tropical grounds and stunning views of Sarasota Bay, The Ringling is a favorite for wedding and receptions. Our friendly and professional staff looks forward to working with you. The following venues are available for evening weddings and receptions. Lend your gathering an air of timeless elegance in a setting that defines romance and the romantic. Dine and dance into the night surrounded by replicas of ancient Greek, Roman and Baroque statuary on magnificently manicured lawns. Here, on the Terrace of Ca’ d’Zan and along the Bayfront Promenade, when the sun sets over the Bay, the lights of Sarasota and Longboat Key and a sky full of stars illuminate the night. Your guests will find themselves swept up in the atmosphere of Sarasota’s most breathtaking setting. Want to create an atmosphere of fun and merriment for your party? The Circus Museum obliges. Guests can bask in all the delights of the circus, self-touring the miniature circus while enjoying dining and drinks outdoors under the tent reminiscent of the Big Top. 1st and 2nd floors remain open for self-touring; food/beverages allowed under exterior tented area.